As dean of admissions at the University of Chicago Law School, Anna Ivey decided the fate of thousands of law school applicants. In this book-the first of its kind by a former law school admissions officer-she draws on her expertise to cover topics from the application and the essay to the interview and the recommendations, touching on hot-button issues like how much the LSAT, ethnicity, and age really matter. Offering an insider's advice on how to produce the very best application, this guide gives straight answers to questions such as: • What kind of essay should I write to set me apart from the rest of the pack? • Should I explain my low LSAT score, my D in chemistry, my attention deficit disorder, my time in rehab? • Is law school worth the debt I'll face when I graduate? 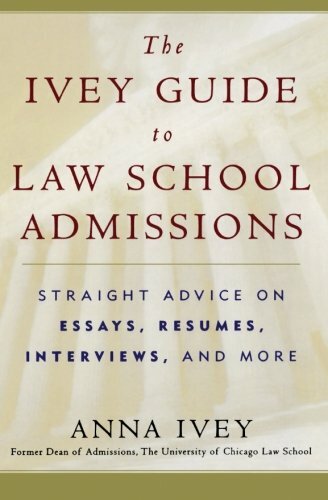 Full of invaluable examples and anecdotes about real admissions decisions, The Ivey Guide to Law School Admissions is certain to become the new bible for would-be law students everywhere.